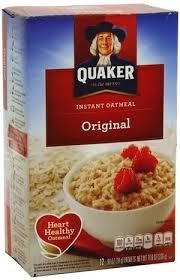 Stef on a journey: QUAKER - my favorite oatmeal brand!!!!! Oatmeal used to have a dull reputation, but not anymore. and maybe a million ways to spice up your porridge, pancakes or bread derived from these magical grains. Quaker is by far my favorite brand. I can't imagine living in a quaker-free house. It would feel like running a hospital without doctors or a restaurant with no spoons. Quaker and Stef: it's a healthy long lasting relationship. No other brand could even come close. Once you go QUAKER, you never go back. But before I get ahead displaying some recipes, it's worth looking into oatmeal's health benefits. - reduces the risks of developing a cardiovascular disease. Here are some of my quaker recipes. Especially my oatmeal bread has become an instant success. I plan on baking a whole new range of variations in the future, so stay tuned.